Focus on Clones and Alternatives of Samsung Mobile,like Galaxy S3, Glaxy s4,Note 2, note 3, mega 6.3. mega 5.8,htc, Blackberry,iPhone, SONY,HUAWEI. Asia's leading chip designer Media Tek has released recent news about a new chip products, bringing even more unexpected surprise. This year not to mention the new production of MT6572 dual core chip, there are a variety of four-core chip MT6580, MT6582, etc. which will be launched soon at the same time, and at the end of year, it is also expected to launch 4G TD-LTE chip MT6290. And today's news shows from the Taiwan media, it’s long rumored that MTK eight-core processors may no longer a myth, code MTK6592 eight-core chip will be upcoming. MTK MT6592 will also be based on 28-nano meter process, the main frequency is very impressive, reaching 1.7GHz-2.0GHz, built eight ARM A7 architecture applications processor, unlike some of the 4 +4 "eight-core", MT6592 has eight physical core and eight core can simultaneously work which is a genuine eight-core mobile processor, or can support Google's next generation operating system Andriod 5.0, support 1080P video encoding and decoding. As the most high-end mobile phone chip of Media Tek, MT6592 will definitely give priority to support a variety of innovative technologies and MT6592's Antutu test runs over 30,000 points, powerful performance is evident. Taiwan media today announced a message that indicates that the Media Tek will hold promotion of MT6592 eight nuclear chip to the domestic and foreign customers in the near future, and also gives the comparatively more specific volume production time, Media Tek's first eight nuclear smart handset solutions MT6592 will be produced by large quantity in November this year. In addition, according to the news of senior insiders in this industry, except for the toppest level's eight nuclear chips MT6592, there is a code MT6588's four-core processors which will also launched soon. 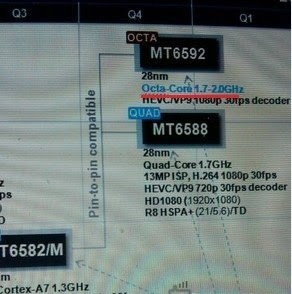 Friends concerned about the site of the machine must know, code MT6589 formerly is named MT6588, but later the name has changed into MT6588 whose specifications areeven more tough, this chip adopts 28nm process as well as Cortex A7 architecture, main frequency up to 1.7GHz, supporting H.264/1080P , 720P-level HEVC and VP9 format decoding, 13 million pixel camera as well as FHD levels of display resolution, supporting for HSPA + / TD high-speed network. arrival,I believe, will be set off a "revolutionary" Of a new round of smart phones in the domestic. More details will be coming soon on OrientDeal.